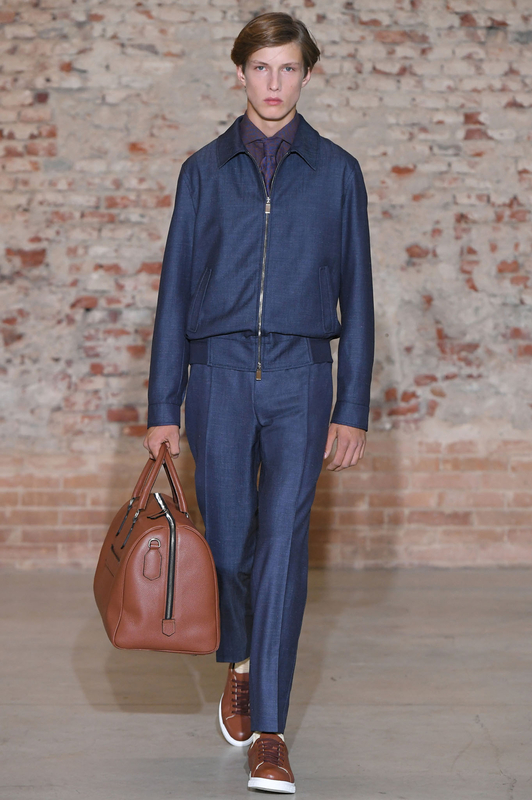 Bomber jacket in wool-silk-linen denim-effect blend with shirt collar, metal zipper, oblique hand pockets, and ribbed elastic waist with knitted C detailing; button-up shirt with French collar in cotton-linen blend printed with graphic play on the Canali name; knitted-silk tie with C details; flat-front pants in wool-silk-linen denim-effect blend, rounded waist band, coin pocket with flap and single button, and besom pocket; calfskin sneakers with lateral C detailing and contrasting patterned sole with graphic play on the Canali name; tumbled calfskin duffle bag with metal zipper and C details, two handles, removable shoulder strap, and back strap to attach to a trolley. 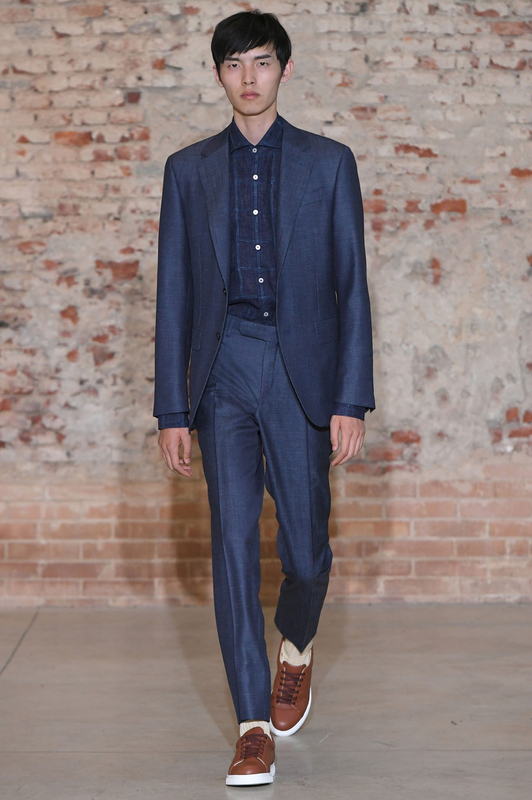 Wool-silk-linen denim-effect suit with single-breasted jacket with two buttons, pockets with flaps, and flat-front pants with rounded waistband and coin pocket with flap and single button; cotton button-up shirt with French collar with windowpane pattern; tumbled calfskin sneakers with lateral C detailing and contrasting patterned sole with graphic play on the Canali name. 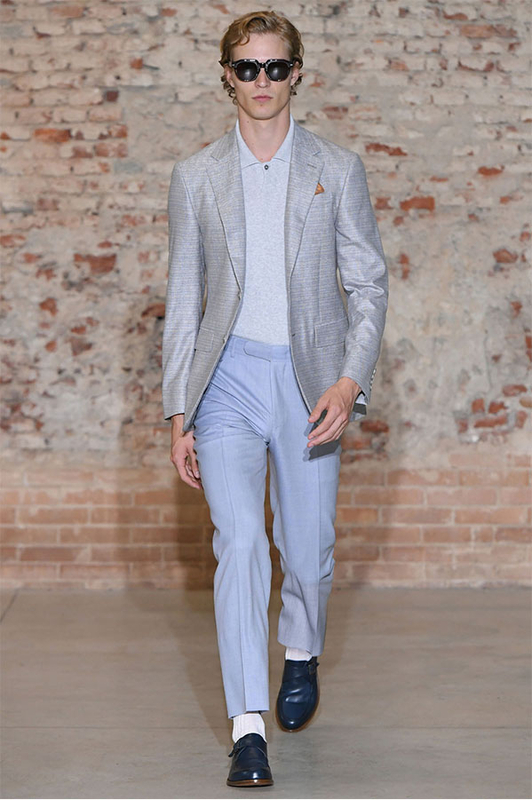 Wool-silk-linen single-breasted unlined blazer with three buttons and pockets with flaps, with overcheck motif over damié background; wool-silk-linen flat-front pants with denim effect, rounded waistband, and coin pocket with flap with single button; striped-cotton twill button-up shirt; tumbled calfskin sneakers with lateral C detailing and contrasting patterned sole with graphic play on the Canali name. 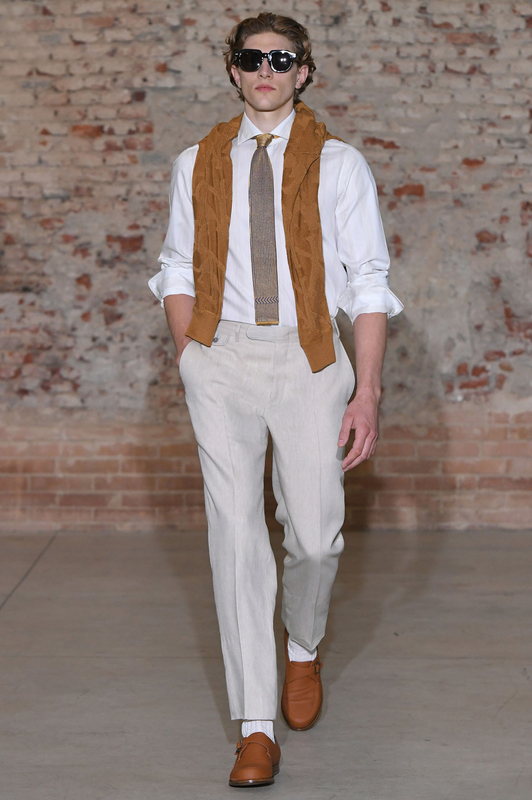 Wool-silk-linen single-breasted blazer with two buttons and pockets with flaps in woven texture; linen-wool textured flat-front pants with quarter-top pockets, rounded waistband, and coin pocket with flap and single button; striped-cotton twill Exclusive button-up shirt; shaded calfskin derby shoes. Wool-silk-linen raincoat with buttons and hidden placket, oblique hand pockets with rounded flaps, and belt with buckle; striped-cotton twill button-up shirt with small collar; tumbled calfskin sneakers with lateral C detailing and contrasting patterned sole with graphic play on the Canali name; tumbled calfskin duffle bag with metal zipper, C details, two handles, removable shoulder strap, and back strap to attach to a trolley. 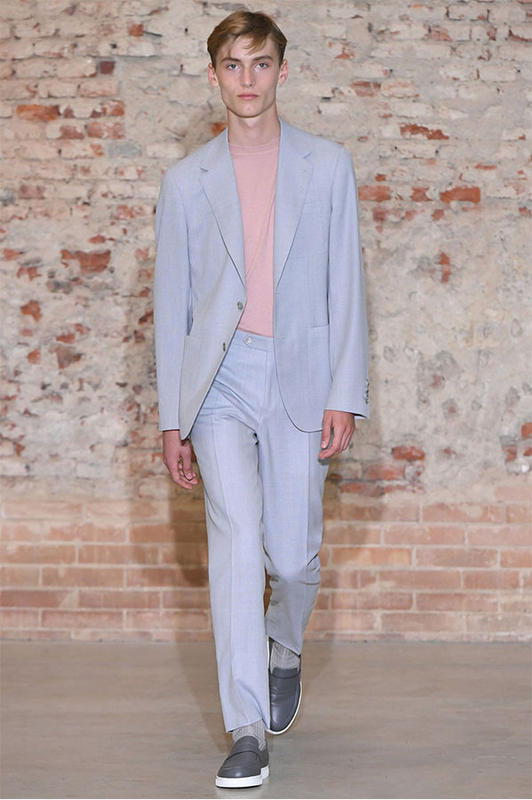 Wool-silk-linen denim-effect suit with single-breasted jacket with two buttons, pockets with flaps, and flat-front pants with quarter-top pockets, rounded waistband and coin pocket with flap and single button; linen-cotton checked button-up shirt with French collar in micro-chenille on a malfilé background; tumbled calfskin sneakers with lateral C detailing and contrasting patterned sole with graphic play on the Canali name. 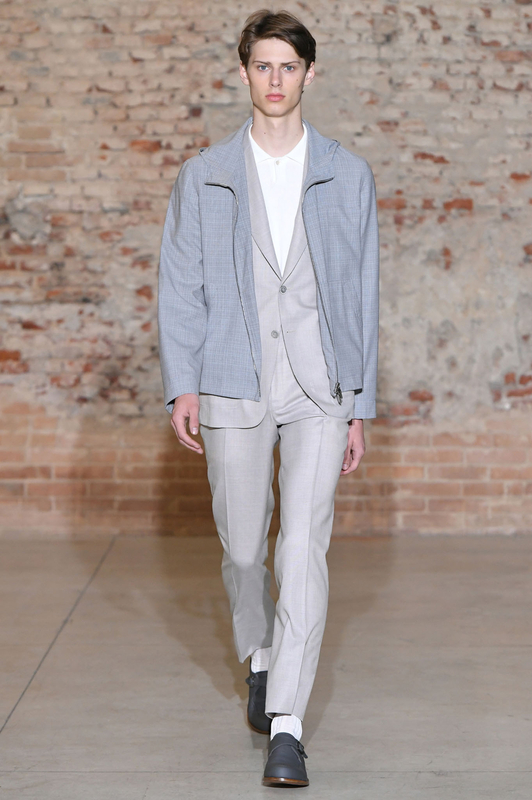 Wool-silk-linen denim-effect bomber jacket with shirt collar, metal zipper, oblique hand pockets, and ribbed elastic waistband with knitted C detailing; Impeccabile striped-cotton button-up shirt; wool-silk-linen flat-front pants with quarter-top pockets, rounded waistband, and coin pocket with flap and single button; shaded calfskin derby shoes. V-neck sweater in ribbed-dyed cotton with braid pattern; cotton-linen button-up shirt with French collar with graphic play on the Canali name; silk tie with print of graphic interpretation of the Canali name; wool-silk-linen denim-effect flat-front pants with quarter-top pockets, rounded waistband, and coin pocket with flap and single button; tumbled calfskin sneakers with lateral C detailing and contrasting patterned sole with graphic play on the Canali name. 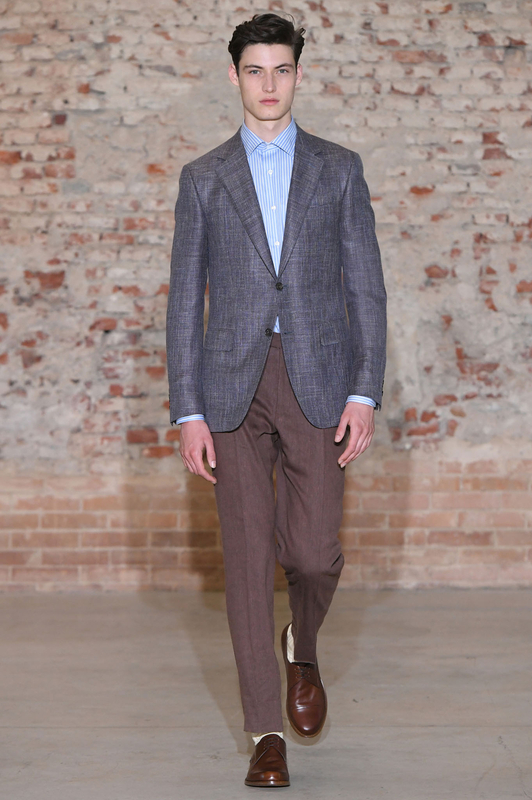 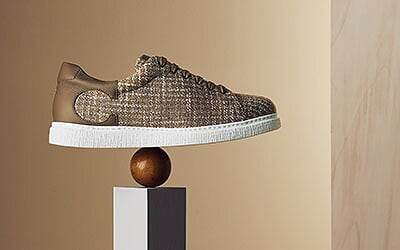 Single-breasted jersey blazer with two buttons and patch pockets; extra-thin cotton crew neck sweater with short sleeves and Canali jacquard detailing; flat-front chino pants in stretch cotton; tumbled calfskin sneakers with lateral C detailing and contrasting patterned sole with graphic play on the Canali name. 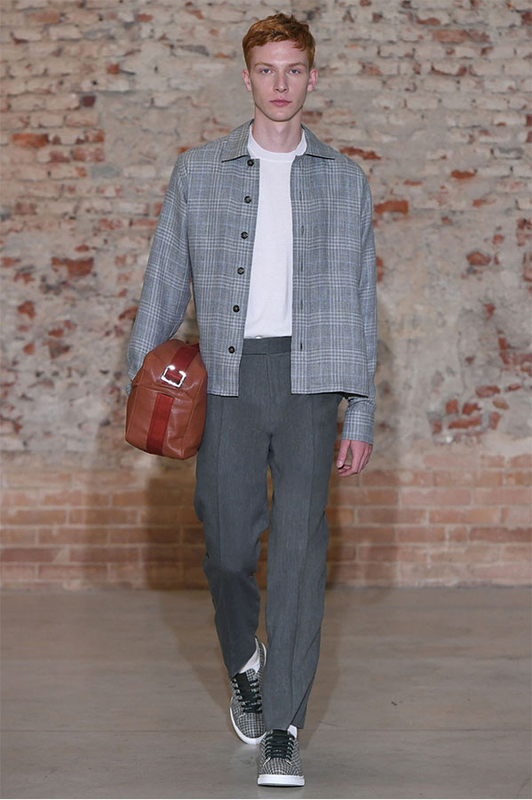 Checked button-up shirt-jacket hybrid in linen-cotton blend on squared background with patched pockets; crew neck sweater with short sleeves in extra-fine mercerized cotton; sneakers in tumbled calfskin and cotton-wool-linen houndstooth fabric with lateral C detailing and contrasting patterned sole with graphic play on the Canali name; goatskin messenger bag with shoulder strap and buckle with C detailing. 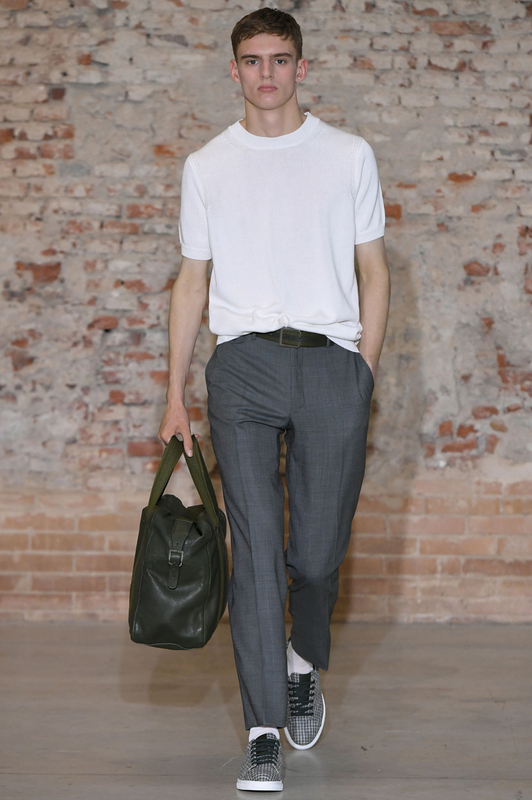 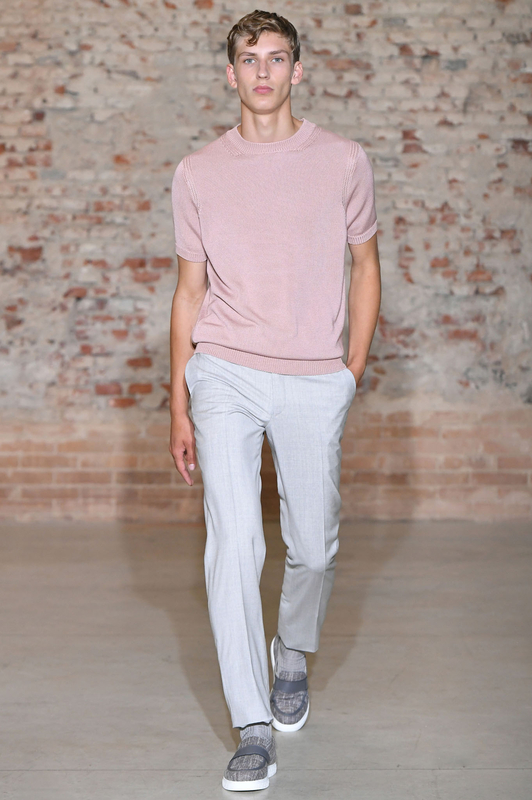 Crew neck sweater with short sleeves in extra-fine mercerized cotton; denim-effect wool flat-front pants with quarter-top pockets, rounded waistband, and coin pocket with flap and single button; sneakers in tumbled calfskin and cotton-wool-linen houndstooth fabric with lateral C detailing and contrasting patterned sole with graphic play on the Canali name; 48-hour bag in goatskin with two handles, shoulder strap, and buckle with C detailing. 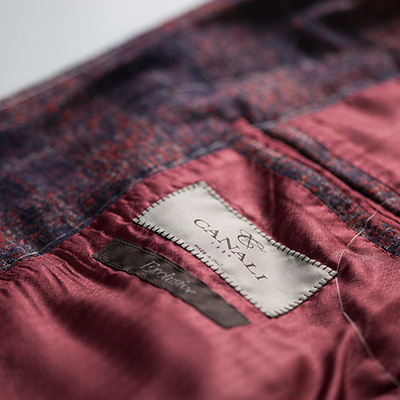 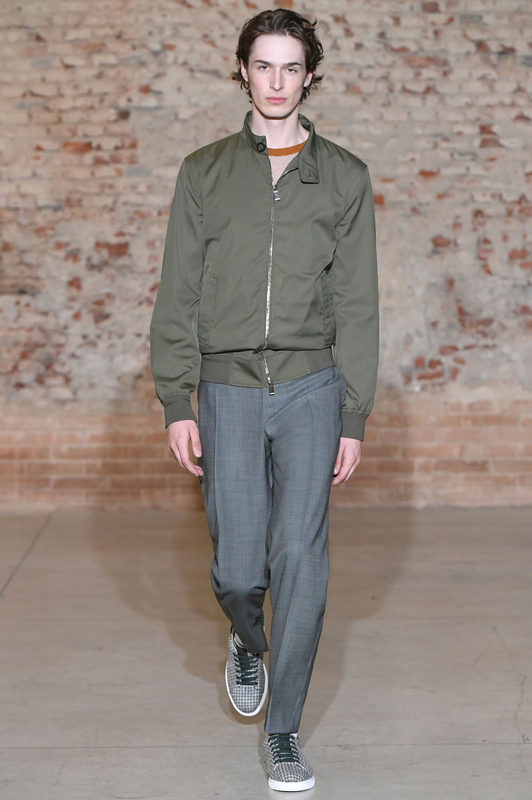 Field jacket in technical fabric with hidden placket, zipper, buttons, oblique hand pockets with rounded flaps, and drawstring at the waist; crew neck sweater with long sleeves in jacquard cotton; chino flat-front stretch cotton pants with rounded waistband; tumbled calfskin sneakers with lateral C detailing and contrasting patterned sole with graphic play on the Canali name; goatskin messenger bag with shoulder strap and buckle with C detailing. 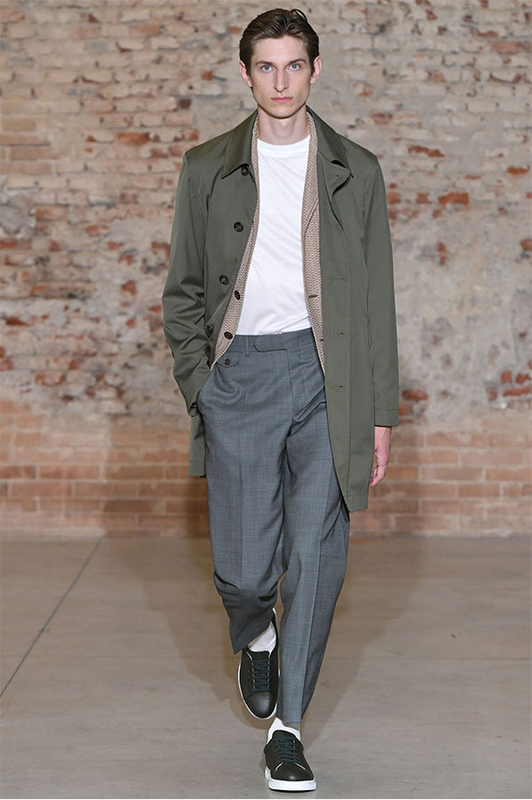 Raincoat in technical fabric with buttons and hidden placket, oblique hand pockets with rounded flaps, and belt with buckle; extra-thin cotton crew neck sweater with short sleeves and Canali jacquard detailing; chino pants in cotton-silk blend, with back pockets and rounded waistband; calfskin sneakers with lateral C detailing and contrasting patterned sole with graphic play on the Canali name. Bomber jacket in technical fabric with stand-up collar, zipper down the middle, oblique hand pockets with rounded flaps, and ribbed waistband; extra-thin cotton crew neck sweater with short sleeves and Canali jacquard detailing; denim-effect wool flat-front pants with quarter-top pockets, rounded waistband, and coin pocket with flap and single button; crew neck sweater with long sleeves in jacquard cotton; sneakers in tumbled calfskin and cotton-wool-linen houndstooth insert with lateral C detailing and contrasting patterned sole with graphic play on the Canali name. 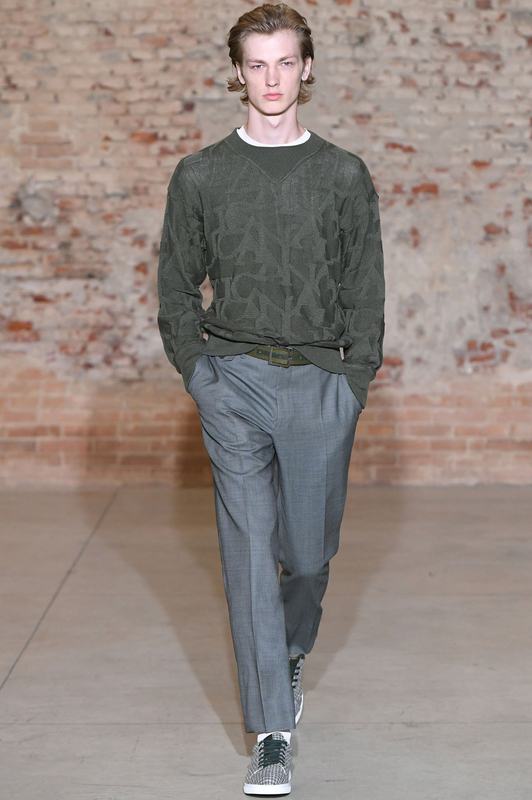 Crew neck sweater in mercerized cotton with print of graphic play on the Canali name; crew neck sweater in mercerized cotton; denim-effect wool flat-front pants with quarter-top pockets, rounded waistband, and coin pocket with flap and single button; cotton belt with buckle with C detailing, sneakers in tumbled calfskin and cotton-wool-linen houndstooth insert with lateral C detailing and contrasting patterned sole with graphic play on the Canali name. 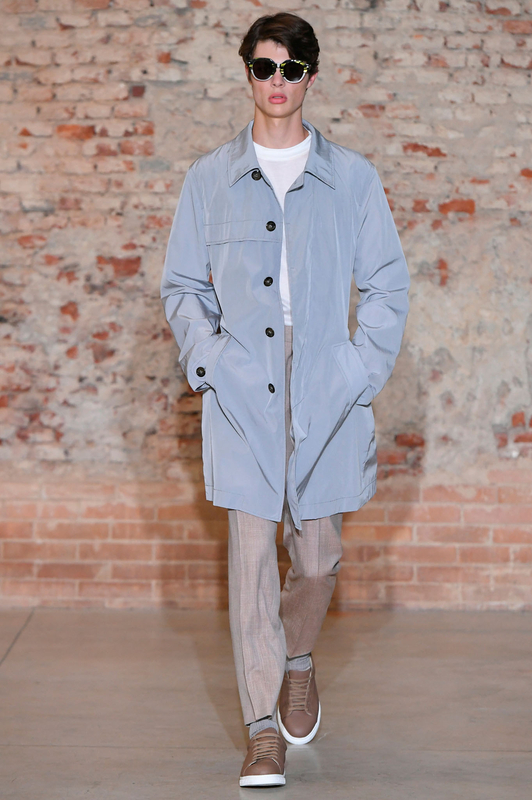 Technical fabric raincoat with buttons and hidden placket, oblique hand pockets with rounded flaps, belt with buckle, and single vent; single-breasted jersey blazer with two buttons and patch pockets; wool denim-effect flat-front pants with quarter-top pockets, rounded waistband, and coin pocket with flap and single button; cotton t-shirt with short sleeves and ribbed edges; sneakers in tumbled calfskin with contrasting patterned sole with graphic play on the Canali name. 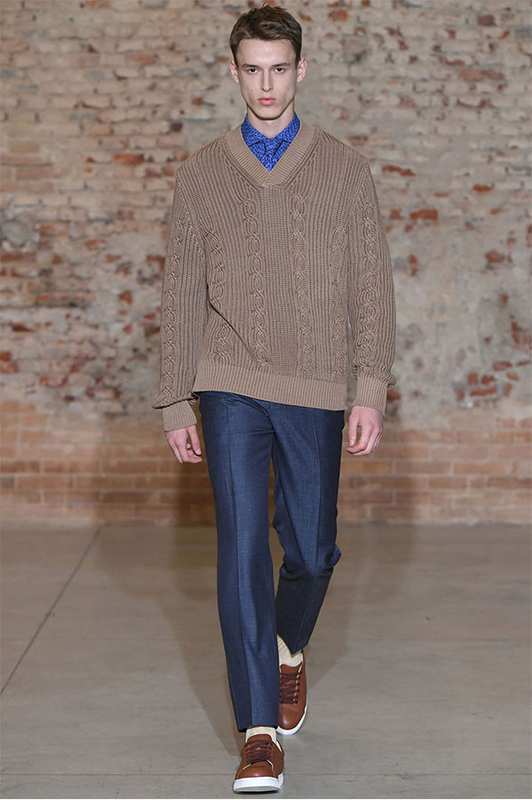 Crew neck sweater in mercerized cotton with print of a graphic play of the Canali name; button-up shirt with striped French collar, linen-wool flat-front pants with quarter-top pockets, and coin pocket with flap and single button; knitted silk tie with C motif; deerskin monk strap shoes with buckle with C detailing; acetate rounded-lens sunglasses with embossed frames. 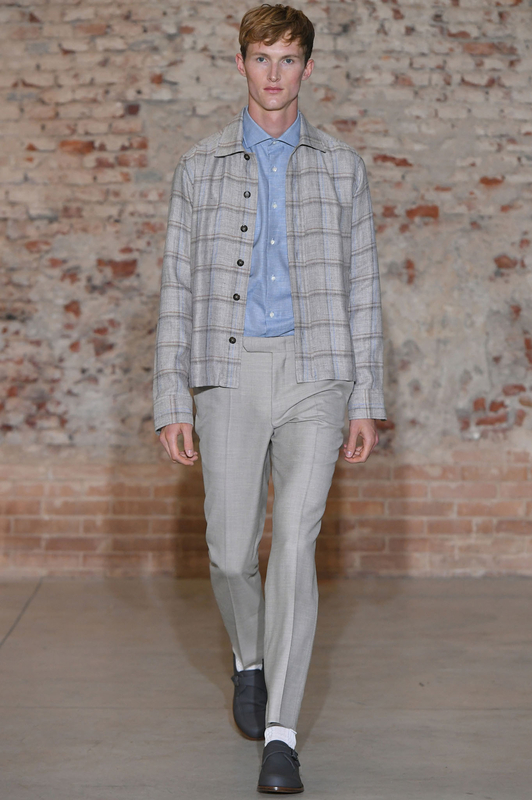 Checked button-up shirt-jacket hybrid in linen-cotton blend with patched pockets and squared print; textured button-up shirt with French collar in cotton-linen blend; wool-silk-linen denim-effect flat-front pants with rounded waistband, quarter-top pockets, coin pocket with flap and single button; deerskin monk strap shoes with one buckle. 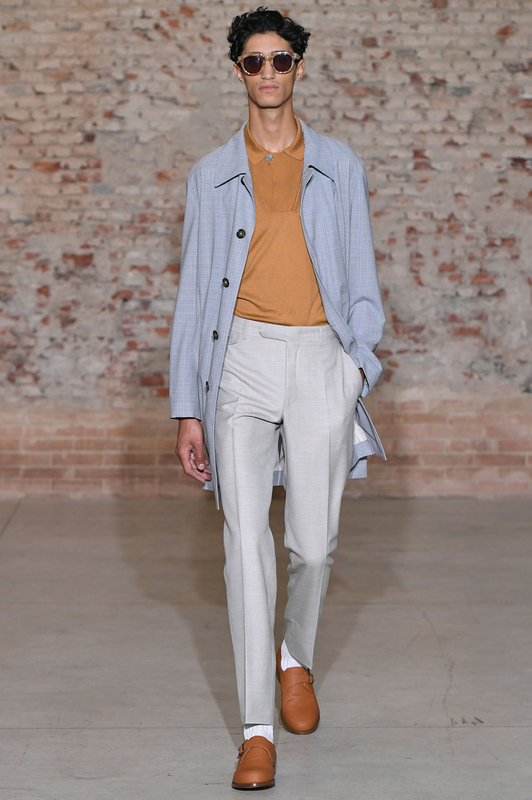 Super140’s wool raincoat with buttons and hidden placket, oblique hand pockets with rounded flaps, and single back vent; mercerized cotton polo shirt with cross-over collar with button; , wool-silk-linen denim-effect flat-front pants with rounded waistband, quarter-top pockets, and coin pocket with flap and single button; deerskin monk strap shoes with one buckle; acetate rounded-lens sunglasses with embossed frames. 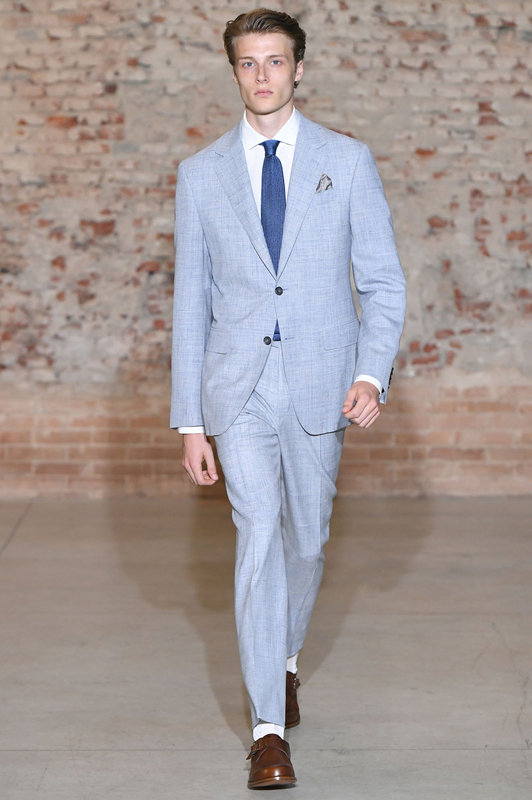 Linen-wool suit with unlined single-breasted jacket with two buttons and patch pockets, flat-front pants with quarter-top pockets and coin pocket with flap and single button; cotton button-up shirt with French collar; knitted silk tie with ‘C’ background motif, deerskin monk strap shoes with buckles with ‘C’ detailing. 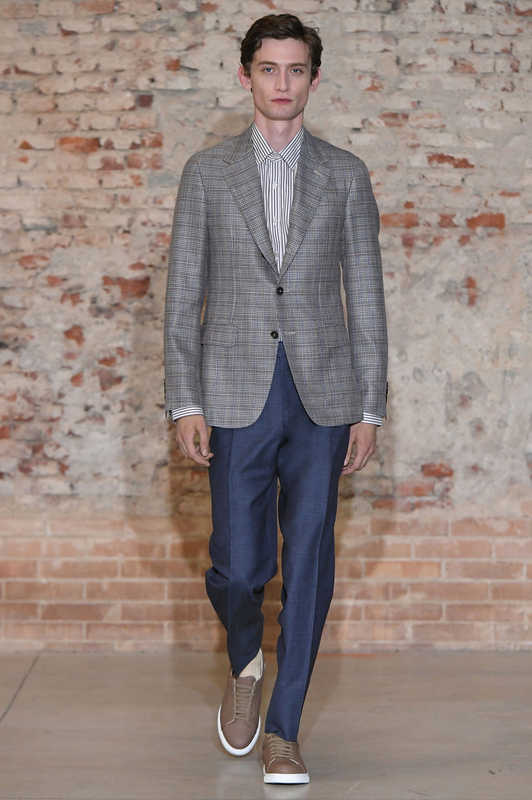 Silk-cashmere woven effect single-breasted blazer with pockets with flaps; textured flat-front pants in Impeccabile wool with quarter-top pockets, and coin pocket with flap and single button; cotton polo shirt with ribbed edges; printed silk pocket square with graphic play on the Canali name and polka dots. 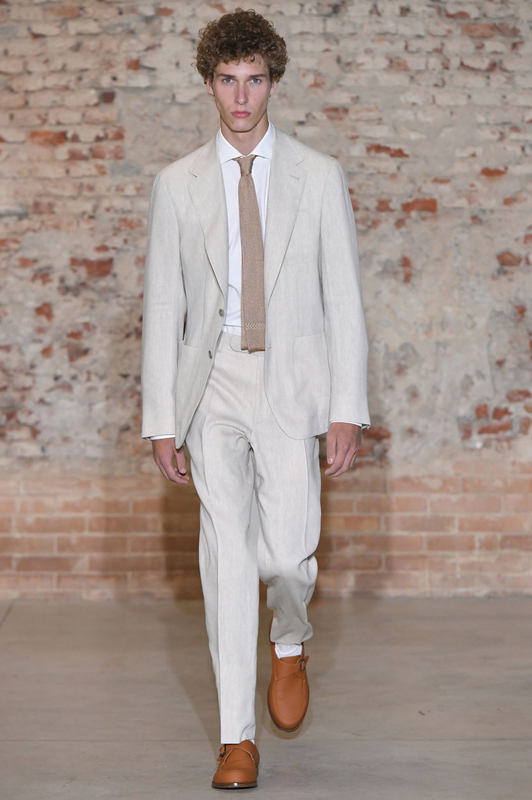 Wool-silk-linen suit with single-breasted jacket with two buttons, pockets with flaps, and flat-front pants with quarter-top pockets, rounded waistband, and coin pocket with flap and single button; cotton-linen button-up shirt with French collar, knitted silk tie with ‘C’ motif; calfskin monk strap shoes with buckles with ‘C’ detailing. 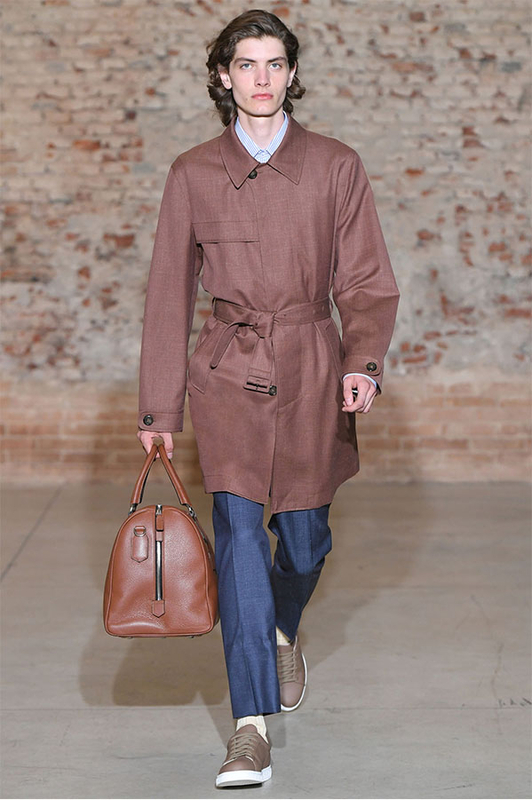 Super140’s wool raincoat with buttons and hidden placket, and oblique hand pockets with rounded flaps; linen button-up shirt with French collar; Impeccabile wool flat-front pants with quarter-top pockets, and coin pocket with flap and single button; knitted-silk tie with ‘C’ motif, deerskin monk strap shoes, acetate rounded-lens sunglasses with embossed frames. 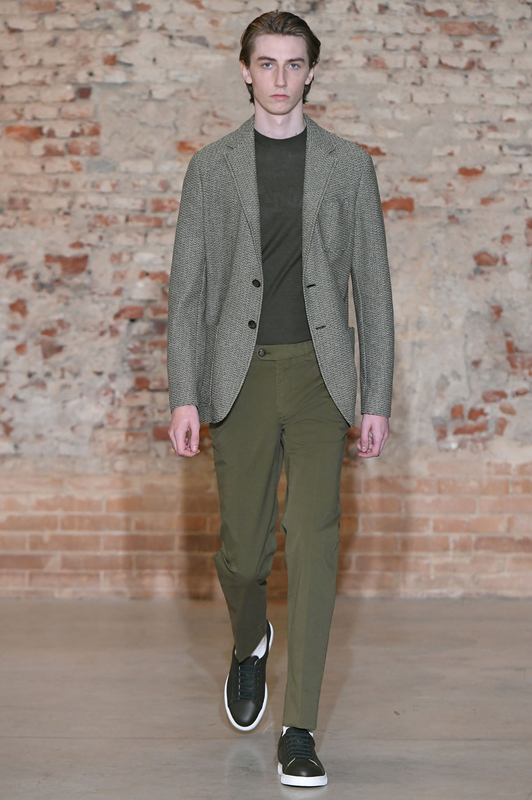 Super 140’s wool jacket with hoodie with front-end pockets, zipper down the middle and buttons; Impeccabile textured-wool suit with unlined single-breasted jacket with two buttons and patch pockets, flat-front pants with quarter-top pockets with coin pocket with flap and single button; extra-fine cotton polo shirt with ribbed edges; deerskin monk strap shoes with buckles with ‘C’ detailing. 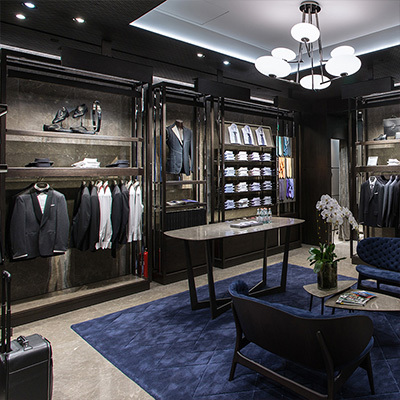 Impeccabile wool suit with single-breasted jacket with two buttons, patch pockets, and flat-front pants with quarter-top pockets; mercerized cotton crew neck sweater; calfskin slip-on shoes with contrasting patterned sole with graphic play on the Canali name. Mercerized cotton crew neck sweater; wool flat-front pants with quarter-top pockets, rounded waistband, and coin pocket with flap and single button; calfskin and cotton-linen-wool slip-on shoes with contrasting patterned sole with graphic play on the Canali name. 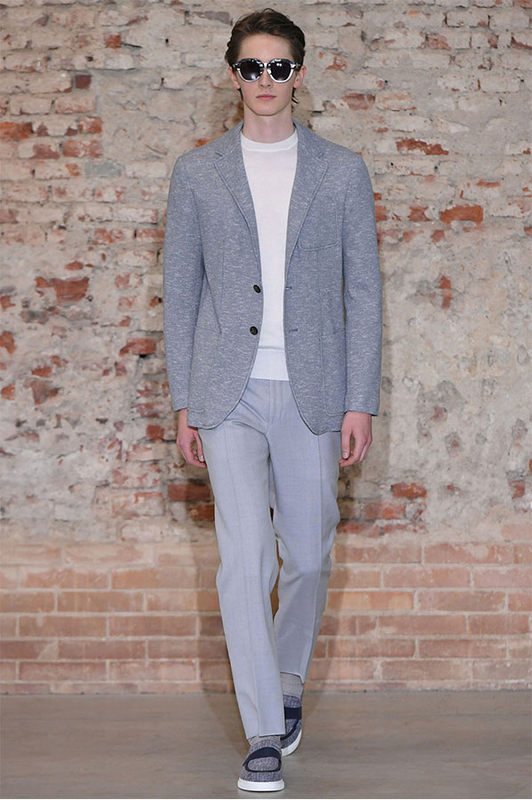 Mouliné jersey single-breasted blazer with two buttons and patch pockets; mercerized cotton crew neck sweater; Impeccabile wool flat-front pants with quarter-top pockets, rounded waistband, and coin pocket with flap and single button; calfskin and cotton-linen-wool slip-on shoes with contrasting patterned sole with graphic play on the Canali name; acetate-titanium rounded-lens sunglasses with embossed frames. 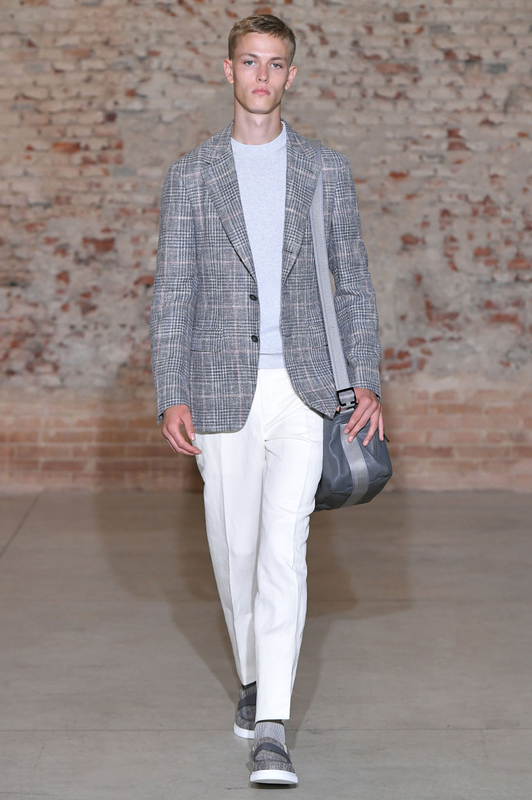 Single-breasted unlined blazer in cotton-linen-wool blend with two buttons and pockets with flaps, and Prince of Wales mouliné; linen-silk flat-front pants with quarter-top pockets, and coin pocket with flap and single button; ribbed-cotton crew neck sweater; tumbled calfskin and cotton-linen-wool slip-on shoes with contrasting patterned sole with graphic play on the Canali name; goatskin messenger bag with shoulder strap and buckle with ‘C’ detailing. 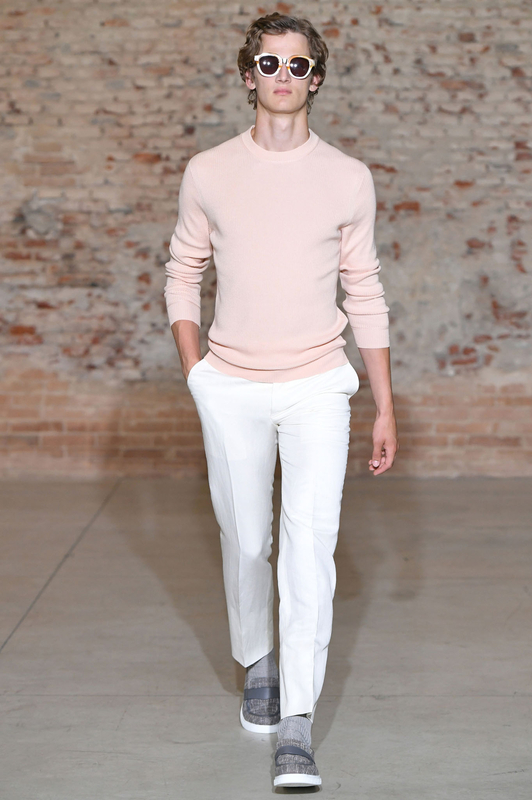 Ribbed-cotton crew neck sweater with long sleeves; linen-silk flat-front pants with quarter-top pockets, rounded waistband, and coin pocket with flap and single button; tumbled calfskin slip-on shoes with contrasting patterned sole with graphic play on the Canali name; acetate-titanium rounded-lens sunglasses with embossed frames. 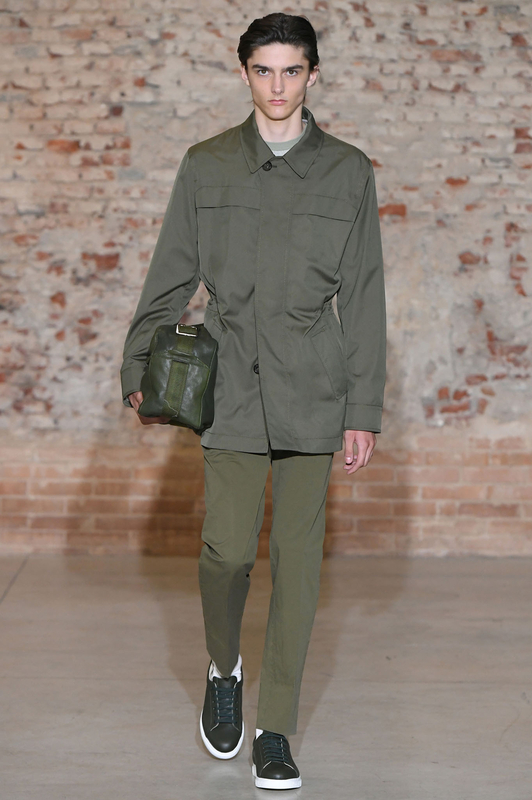 Technical fabric raincoat with buttons and hidden placket, oblique hand pockets with rounded flaps, and belt with buckle; wool-silk-linen flat-front pants with denim-effect, rounded waistband, with coin pocket with flap and single button; cotton t-shirt with ribbed edges; tumbled calfskin sneakers with contrasting patterned sole with graphic play on the Canali name; acetate-titanium rounded-lens sunglasses with embossed frames. 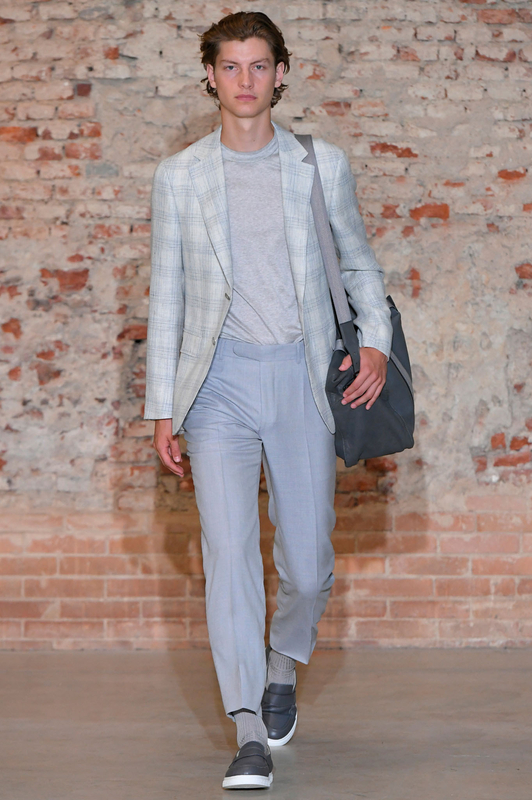 Linen-wool single-breasted blazer with two buttons and pockets with flaps; Impeccabile wool flat-front pants with quarter-top pockets, rounded waistband, and coin pocket with flap and single button; cotton t-shirt with ribbed edges; tumbled calfskin slip-on shoes with contrasting patterned sole with graphic play on the Canali name; goatskin messenger bag with shoulder strap and buckle with ‘C’ detailing. 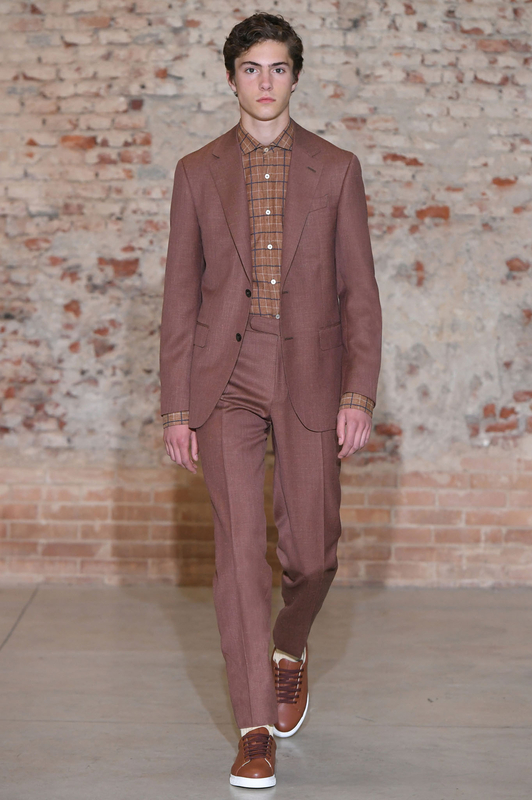 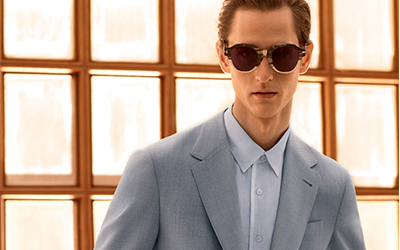 Wool-silk-linen suit with unlined single-breasted jacket with two buttons, patch pockets, and flat-front pants with quarter-top pockets; cotton t-shirt with ribbed edges; tumbled calfskin sneakers with contrasting patterned sole with graphic play on the Canali name; acetate-titanium rounded-lens sunglasses with embossed frames. 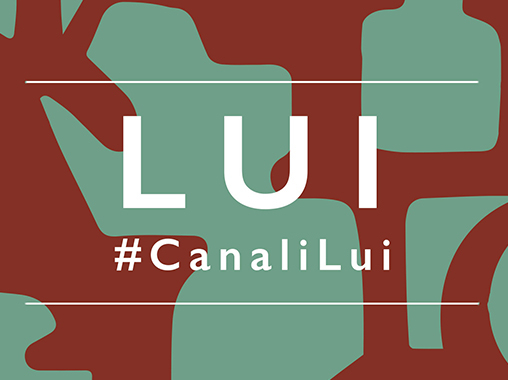 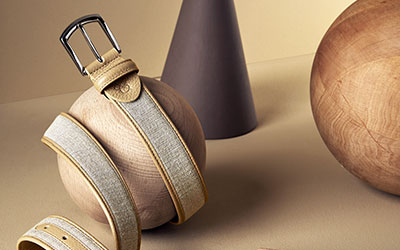 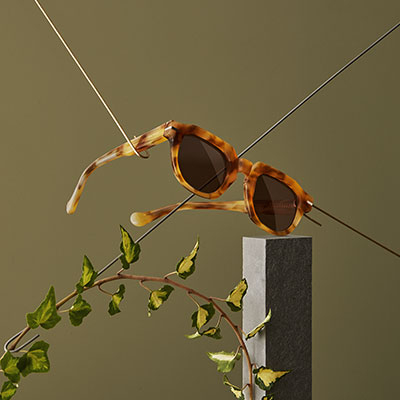 For LUI style is an expression of a state of mind echoed in four “rooms” – Equilibrium, Dynamism, Steadiness and Inspiration. 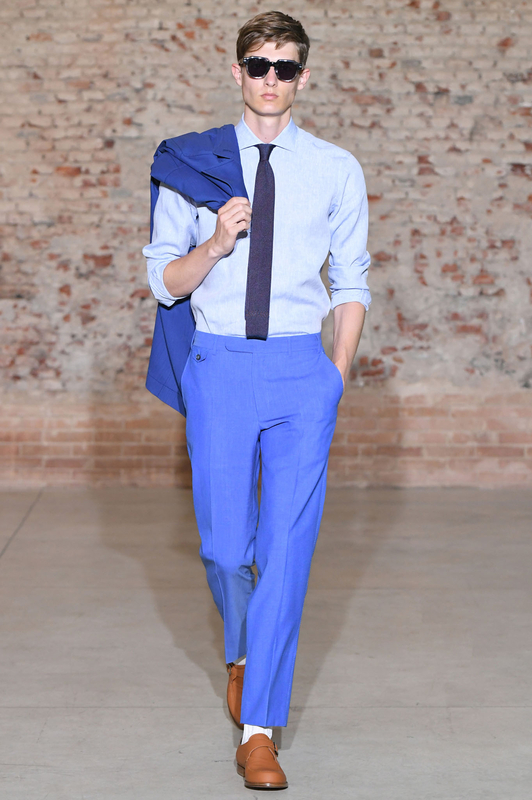 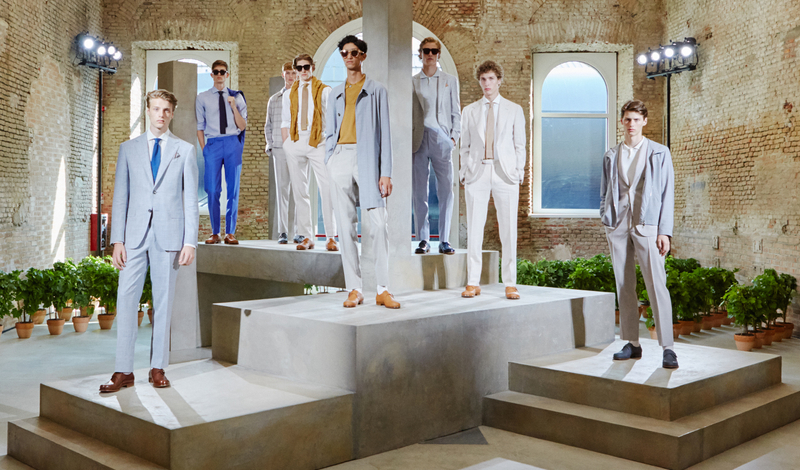 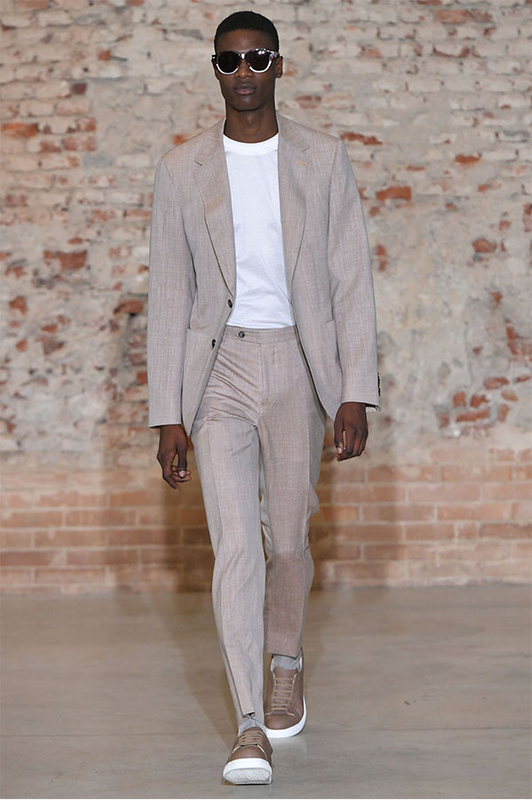 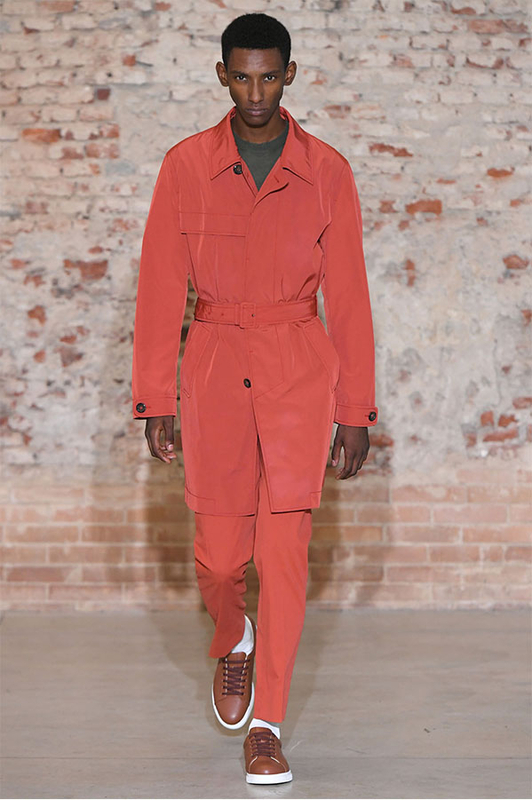 The American Menswear and Lifestyle influencer attended our Spring Summer 2019 collection presentation in a full look Canali.